Early this morning, a couple of sites posted specs from the upcoming low end 13" MacBook Pro and revealed that Apple will be incorporating Light Peak into the new machines under the name "Thunderbolt". We've confirmed that these specs and photos are legitimate, but only for the low end 13" MacBook Pro model. We still haven't seen the specs for the mid-range and high-end model. 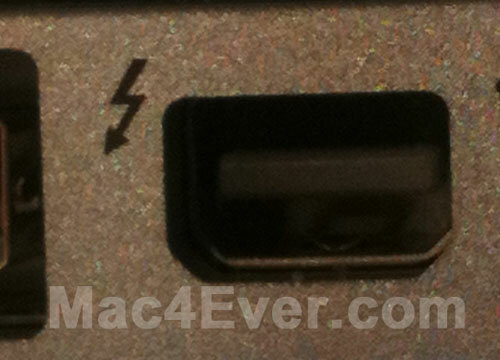 Mac4Ever has posted a followup close-up image of the new Thunderbolt/DisplayPort hybrid port found on the new 13" MacBook Pro. Intel is expected to officially launch Light Peak/Thunderbolt on Thursday alongside Apple's new MacBook Pros. thunderbolt is such a ***** name. I like ThunderBolt for the copper implementation...and later, LightningBolt for real "light" fibre implementation. Guys, I don't get it at all! Why on earth would they integrate that with the Display-Port connector? Doesn't make any sense. What they are doing is making it so that the display's peripheral connections connect to the Mac using one cable. instead of three headed hydra connector from Cinema displays would have two. I was certain Intel had planned to introduce lightpeak with a USB-compatible connector?! Why so people can be confused when it doesn't fit ? I'll be way harder to find devices with this connector then. like mini-display ports are plentiful. Again .... this is par-for-the-course with Apple. When have they been afraid of a non standard display connector in the last 10 years ? In my eyes this proofs that Apple (and maybe even intel) is not planning to attack USB3 at all.